Speculator aims to target stocks that tend to fly under the radar, perhaps due to the fact that they don’t suit the risk-averse investor, or simply because they are small emerging potentially next big thing stories where the market moving news is yet to break. FinFeed will be looking to uncover such stocks on a weekly basis. 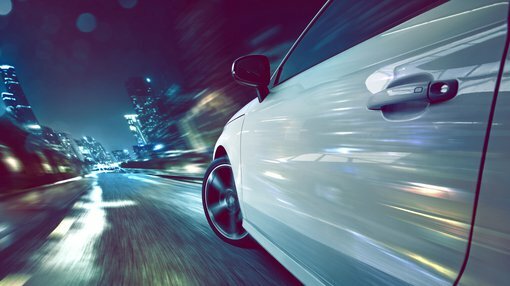 It may be time for speculative investors to wade back into online automotive advertising group LatAm Autos (ASX:LAA) with the company now demonstrating the benefits of a restructure that occurred some 12 months ago after management acknowledged it was time to exit underperforming areas of its business. Uncertainty leading up to the restructure triggered a substantial share price downturn, but investors appear to be relatively confident that a recovery is underway, and indeed there is the potential for the new look business to deliver significant upside. However, this does remain a speculative stock and investors should seek professional financial advice if considering this stock for their portfolio. Furthermore, the company recently raised $8 million in capital at an issue price of 20 cents per share, broadly in line with its recent trading range. With regard to the company’s share price performance, it more than doubled from 10.5 cents in May to hit a 12 month high of 24 cents in August. However, LatAm traded as high as 42.5 cents after listing on the ASX in 2014, and there is no doubt that the company is today a more focused operation with diversified revenue streams, multiple markets and the financial capacity to grow its various businesses in South America. LatAm Autos is the leading Vehicle Transaction Market Place (VTMP) in Mexico and Ecuador. Similar to the $3.6 billion carsales.com (ASX:CAR), the company is capitalising on the shift of automotive classifieds advertising to online channels, but there are some points of difference in terms of product offerings. For example, LatAm provides cross-sell products on its VTMP to car buyers and dealers through its Motorfy mobile app. Motorfy brings together buyers and sellers of motor vehicles and their related Product Partners who provide two categories of cross-sell products, vehicle finance and value-added products such as insurance, extended warranty and car tracking technology. LatAm receives upfront fees for distributing Product Partners’ products and does not assume any related credit or underwriting risk. 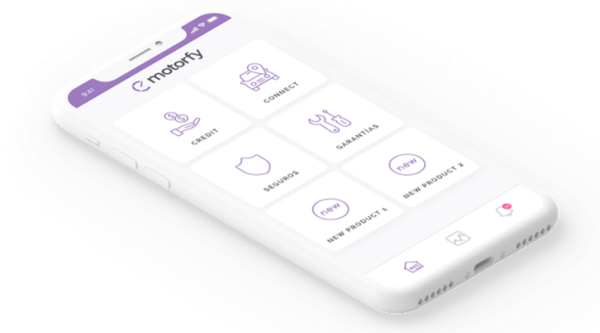 In late August, the company signed a loan distribution agreement with a new credit provider that will provide an additional non-bank secured loan option for car buyers on the Motorfy platform, complementing its existing ‘near-prime’ car finance product. Once again, the company does not assume any credit or underwriting risk in relation to this product which is pitched at loan applications for car buyers with limited or no credit history, or non-conforming loans as they are referred to in Australia. It is worth noting that this type of loan comprises nearly 40% of existing loan applications. Under the terms of the agreement, LatAm is paid an origination fee upon disbursement of the loan and it is the exclusive online classifieds channel partner in Mexico for this partner. This sector of the company’s business has the potential to generate substantial growth, demonstrated by the 360% increase in monthly loan applications since the end of 2017. Management recently noted that cross-sell revenues have grown rapidly in Mexico from the formal launch in early 2017, to the point where they accounted for 30% of group revenue in the first half of calendar year 2018. LatAm reports on a calendar year basis, and analysts at Foster Stockbroking are forecasting revenues to increase 65% from $5.6 million in 2017 to $9.2 million in 2018. As the new business model gains further traction and the company benefits from a full year contribution from recent income accretive initiatives in fiscal 2019 the broker expects revenues to nearly double to $18.3 million. Based on the broker’s projections, the company is expected to deliver its first positive underlying earnings result in fiscal 2019 with EBITDA of $1.3 million. 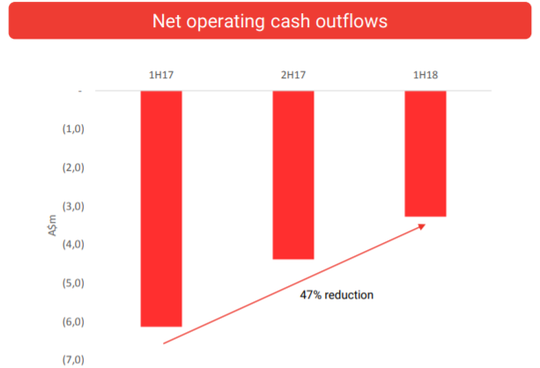 With the company growing off a relatively fixed cost base in 2020, much of the incremental revenue growth in that year is expected to drop straight to the bottom line with underlying earnings forecast to be in the order of $15.1 million, representing earnings per share of 1.9 cents. This places the company on a 2020 PE multiple of 11.5, compared with carsales.com’s 2020 multiple of 22.5. Does size count when we’re comparing growth? While comparing a $90 million company with a $3.6 billion company based purely on PE multiples doesn’t throw up all of the appropriate metrics to make an investment decision, it is an interesting means of examining LatAm’s growth prospects and whether they are captured in the share price. PE multiples are particularly linked to growth, and in back of the envelope terms a company like carsales.com should be able to deliver near to medium-term annual earnings per share growth of circa 22% based on its multiple. Similarly, LatAm should be generating annual earnings per share growth of about 11%. Carsales.com’s valuation is looking toppy given that consensus forecasts indicate annual earnings per share growth of just under 13% over the next two years. On face value though, that looks a whole lot better than LatAm given Foster’s is forecasting negative earnings per share in 2018 and 2019, but importantly the company is forecast to improve its negative earnings position towards breakeven over the next two years, representing growth in a different sort of way. Furthermore, the company is a relatively immature business that with all things going to plan should generate outstanding earnings per share growth from 2020 onwards. As a means of comparison, carsales.com was a profitable entity when it listed on the ASX in September 2009. The company generated earnings per share of 18.5 cents in fiscal 2010, and in the next three years this nearly doubled to 35.2 cents, implying three-year compound annual earnings per share growth of 24%. Carsales’ average PE multiple across this three-year period was 22, broadly in line with its average annual earnings per share growth, and interestingly the same as its fiscal 2020 multiple. This raises the question as to whether LatAm will experience the level of growth that justifies a 20+ PE multiple two years from now. If the business cranks into gear and management meets its milestones there could well be a PE based rerating, but this would normally happen well before the company delivers its maiden profit. Rather, it is likely to be some 12 months prior when the earnings predictability is such that it becomes a stock for not just speculative punters but savvy, ahead of the curve investors. 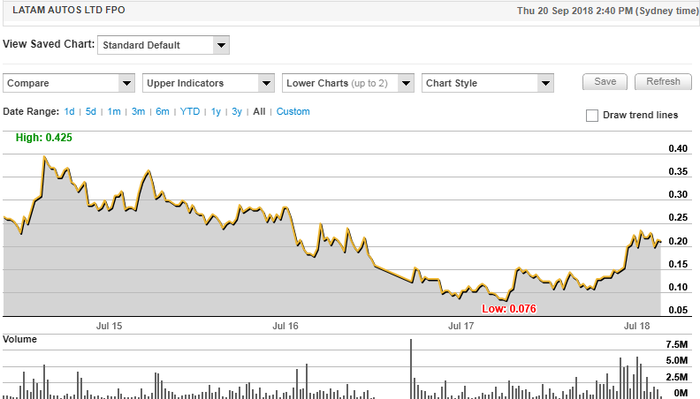 On that note, it is worth examining the graphics below where the left-hand bar chart shows the first substantial uptick (+72%) in year on year first half revenues since listing on the ASX. As a new company that has had to invest heavily upfront in building a presence, this could be the sighter that prospective investors sitting on the sidelines have been waiting for. This is a good sign, as similar to other online advertising businesses, as it matures and its cost base plateaus, LatAm’s profitability should grow exponentially, as much of the top line build translates into earnings. Importantly, LatAm’s net operating cash outflows for the first half of 2018 were nearly half that of the previous corresponding period. Fosters has a price target of 29 cents on the stock, implying a PE multiple of 15.2 relative to its 2020 earnings forecasts. Perhaps that isn’t a bad stance to take when the company is still two years out from hitting this target. The price target implies upside of 38% to Thursday morning’s opening price of 21 cents, indicating there is some potential capital gain there for speculative investors. Of course, it should be noted that broker projections and price targets are only estimates and may not be met. Those considering this stock should seek independent financial advice. Key growth catalysts identified by Fosters are cash flow breakeven by year-end, continued high growth in Motorfy cross sell units, growth in dealer network and loans per dealer, continued growth in its classifieds business and increased online penetration and proportionate market share. The demographics certainly appear to be working in LatAm’s favour with more than half the population of Mexico aged below 30 and 2.2 million people per year becoming licensed drivers. Management sees the potential for 4 million new and used car loans per year in Mexico alone with 67% of the 1.6 million new car sales per year funded under financial terms. However, LatAm needs to be considered as a speculative investment because it is still to deliver on a number of operational fronts, but it should also be noted that crunching the numbers as we have and using the opinion-based forecasts that are in front of us adds another degree of speculation. While there are plenty of uncertainties though, the reason many astute investors have a smattering of speculative stocks in their otherwise more predictable portfolios is that the higher risk will hopefully deliver proportionately higher returns.